Racism and violence, of the kind we saw in Charlottesville, Va, this past week always merit our outage and condemnation. But we have to be careful. Such attitudes pose a subtle danger: they can be overly simplistic and serve to obscure underlying issues that contribute to the unrest. History has taught us that racism and violence are often symptoms of a deeper malaise rooted in economic hardship. That was one of the lessons learned from the Nazis in W.W.II. They were able to exploit people’s economic anxiety and fear to create a police state that persecuted and killed Jews and other minorities. America today is not Nazi Germany. But there are parallels, not the least of which is an elected leader wiling to stoke fear and division for political gain rather than encouraging people to come together to pursue a greater, public good. Meanwhile, economic opportunity and upward mobility have all but vanished for many Americans, rural and urban, white and black. People feel trapped; there’s no place to go; the future looks bleak, and they lash out at everyone and everything that is different from them. In a democratic society, we have a responsibility not only to condemn the racism and violence, but also to try to understand and address underlying issues – including pervasive poverty and a broken economy that leaves people feeling frustrated and trapped with few options for improving their lives. Of course Trump has said many times that fixing the economy so it works for everyone is a central goal of his administration. But his is purposefully misleading rhetoric designed to inflame passions rather than heal wounds. The problem is all those immigrants and foreigners taking our jobs! Trump and others like him are the problem, not the solution. Scratch the surface of his policy proposals and its tax cuts for the rich that is at the core of Trump’s agenda (and that of his Republican allies in Congress). The reality is that fixing the economy requires just the opposite: raising taxes on the wealthy, whose incomes have skyrocketed in recent decades while wages for working Americans have stagnated. Taxes on high earners are at the lowest point in modern history. The proceeds of the higher taxes should be invested in basic infrastructure, roads, bridges and transit systems – and in people, in health care, education and job training. That would stimulate job creation and economic growth for all Americans. 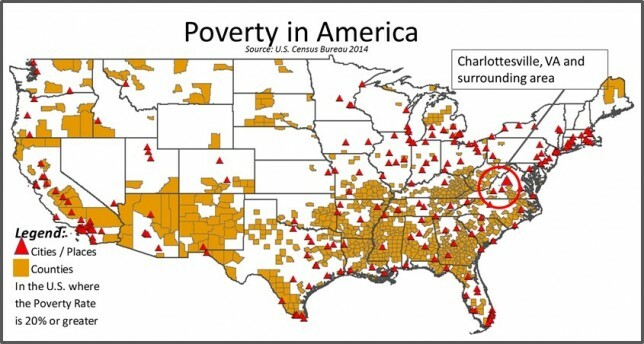 Particular emphasis should be placed on investing in inner cities and rural areas where poverty and lack of opportunity are most pervasive. Sounds like a heavy lift, and it is. Politicians who propose higher taxes of any kind quickly become fodder for a flurry of attack ads. Fortunately, there are some politicians willing to step-up: Senator Bernie Sanders, the former Democratic presidential nominee, for one; more recently, Mayor Bill de Blasio of New York proposed a tax on those earning over $500,000 to pay for long overdue subway repairs that primarily benefit working class New Yorkers. We should always condemn racism and violence in all its forms, but we should never stop searching for the underlying causes and work to address those issues. A rigged economy, that favors the wealthy while leaving working and poor people behind, is a contributing factor to the kind racism and violence we’re seeing in Charlottesville (and around the word). The very fabric of American democracy is fraying. It is time to fix it, with real, concrete economic reforms that improve the lives of all Americans, black, brown and white.